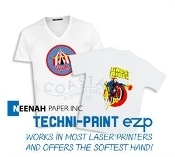 Designed for both fuser oil and oil-less laser printers and copiers, Techni-Print EZP is the newest release from Neenah Paper. This product is a revolutionary laser paper - easy to use and an incredibly soft hand. Techni-Print EZP is the perfect fit for transferring personalized photos and images to light colored shirts, sweatshirts, mousepads, coasters, puzzles, leather and other materials. Techni-Print EZP offers the same great wash and vibrant colors as Techni-Print 4.0, but now features a softer hand, a hand ironing option and a wider range of compatibility with laser printers. As with most laser transfer papers, customers may need to go through a trial-and-error period in order to find the heat press settings and pressing process needed to achieve best results. NOTE:Though home iron use is an option with this paper, you will receive best results when using a heat press. Home irons may cause discoloration on transfer.